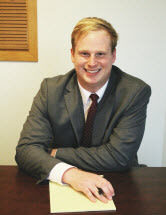 Colin is a graduate of Marquette University Law School, and is a member of the Wisconsin Bar Association as well as the Dane County Bar Association. He practices law in Southeastern Wisconsin, handling family law matters such as child support, divorce, custody, placement, and visitation. Colin was recently married and lives outside Madison with his wife, where they met as freshmen in the dorms while attending UW-Madison. Colin is an avid hockey player, and roots for the Toronto Maple Leafs as part of his family is from Canada. He also enjoys golfing, watching football (Go Pack Go! ), reading, and travelling, especially to Nova Scotia, Canada.